Several people have expressed interest in rock balancing, so I decided to do a separate post on balancing rocks in Narragansett. My husband and I have very different styles. He is a performer (a professional musician) and doesn’t mind balancing rocks where there are lots of people around to interact with. He tends to create a lot of balances in a short amount of time…and keeps going! And he doesn’t mind working in the intense heat of the midday, summer sun. I, on the other hand, prefer to retreat to a more private, picturesque spot and make it a meditation, thinking photographically. My balances are smaller and simpler than his, but I find beauty within the simplicity. At Scarborough Beach on our first day of vacation, I wandered off to adjacent Black Point to explore the tidal pools and found the perfect, quiet spot to balance rocks. By the time I returned to the beach, Jack had created more balances than I could count and was attracting a lot of attention. Most everyone who walked by stopped to take pictures. As we began to pack up at the end of the day, a boy who appeared to be about 12 years old came along with his mother, siblings (I’m guessing), and a long stick. I watched him wind up, wondering if he’d dare to follow through, and then – smack! – he knocked down one of Jack’s balances. When his mother realized the artist was close by and had witnessed the act of destruction, she apologized and promised her son would put the rocks back like they were. We had to laugh because that wasn’t possible; it takes skill and practice! We’d always wondered who was responsible for knocking down rock balances, and now we had the answer: Boys with sticks! The next morning, I got up at dawn to experience and photograph the sunrise over the ocean. Then I headed back to Black Point and found three of my five balances still standing on the rim of a tidal pool. I walked back to the beach to see which of Jack’s balances lasted through the night. On my way back to the car, I stopped to fully savor the waves crashing against the rocks and created a few more simple balances. The sound of crickets accompanied the sound of the waves in a soothing, coastal symphony. The rhythmic sounds and aromatic ocean air, along with the feel of the wind against my skin and the rocks in my hands – all within such a magnificent landscape – was a wonderful sensory experience. To awaken so many senses simultaneously is to feel truly alive! Looking toward the lighthouse, we noticed some rock balances and before leaving took a walk to check them out. 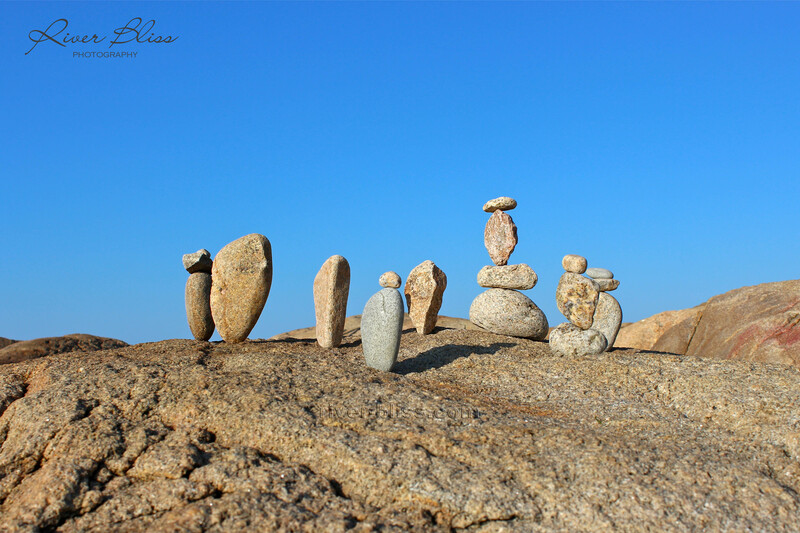 We were astonished to find easily upwards of 500 rock stacks, balances, and arrangements! I couldn’t capture an image that illustrates the sheer number of balances or the vastness of the area. It was nearly overwhelming to be in the midst of it! The next morning, I woke up bright and early and went to the same spot as the previous morning to view the sunrise. Then I walked along the rock jetty opposite the lighthouse and was drawn to a quiet spot to balance rocks as waves crashed against the jetty and onto the beach. I can say without hyperbole that I’ve never felt more in my element than when balancing rocks at sunrise at the ocean in complete solitude (although kayaking and playing piano under the right circumstances come close). I love how simple balances look with waves crashing around them. Something about that really speaks to me of achieving balance within the “full catastrophe” of life, to borrow a phrase from Jon Kabat-Zinn. I played around with the same base rock and different combinations and angles on top. Meanwhile, Jack prepared to head to a beach very close to the house where he had balanced lots of rocks the previous day. He found them still standing and noticed kids approaching them to knock them down. However, older people intervened to protect the rocks and thanked him for beautifying their beach with art. The temporary and vulnerable nature of balanced rocks is part of its appeal, in my opinion, for it mirrors the transitory nature of life. It’s much like a sand mandala that Tibetan Buddhist monks create with great patience, devotion, and attention to detail, only to have it ritualistically destroyed and the sand returned to nature. Some friends and followers have inquired about how to get started balancing rocks. Balanced stone artist, Peter Juhl, has put together some useful resources, including his book, Center of Gravity: A Guide to the Practice of Rock Balancing, and his Temporary Sculpture website. They are excellent, inspiring starting points. After publishing this post, I’m heading to my classroom to get set up and am bringing a basket of ocean rocks with me. This year, I intend to introduce my kindergartners to rock balancing, stacking, and arranging!